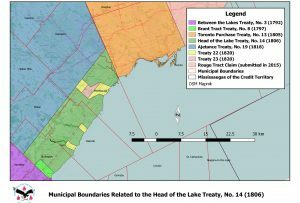 The Crown, in the 1780s, recognized the need to secure communication and supply lines to their western outposts and to unite the settlements along Lake Ontario from Kingston to Niagara. In order to meet Crown objectives, Sir John Johnston, Superintendent General of the Indian Department, met in 1787 with a number of Mississaugas at the Bay of Quinte where the Mississaugas of the Credit purportedly sold the lands of the Toronto Purchase Treaty. 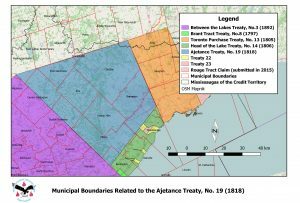 A supposed deed documenting the sale of the lands was found years later and raised serious questions about the legitimacy of the deal between the Crown and the Mississaugas. Problematically, the deed was found blank and had no description of the land “purchased” by the Crown. Also of concern was that the marks of the chiefs who had agreed to the sale were written on separate pieces of paper and then affixed to the blank deed. 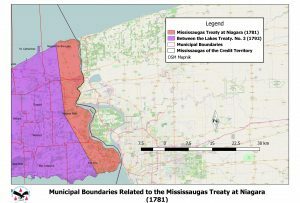 An attempt to survey the Toronto Purchase Treaty lands in 1788 met Mississauga opposition indicating that there had been no clear delineation of land boundaries agreed upon by the Crown and the First Nation. 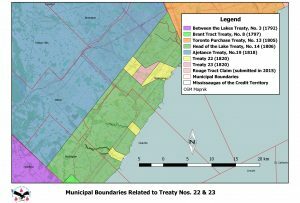 Crown administrators soon doubted the legality of the Toronto Purchase Treaty and were concerned that many settlers did not have legal title to their homesteads. Also disconcerting was the possibility that York, the capital of Upper Canada, was located on land of dubious legal title. 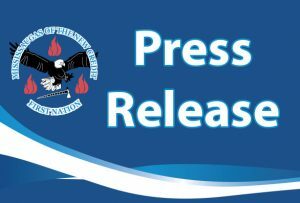 For over ten years the Crown failed to act on the dilemma until a new agreement was negotiated with the Mississaugas of the Credit. 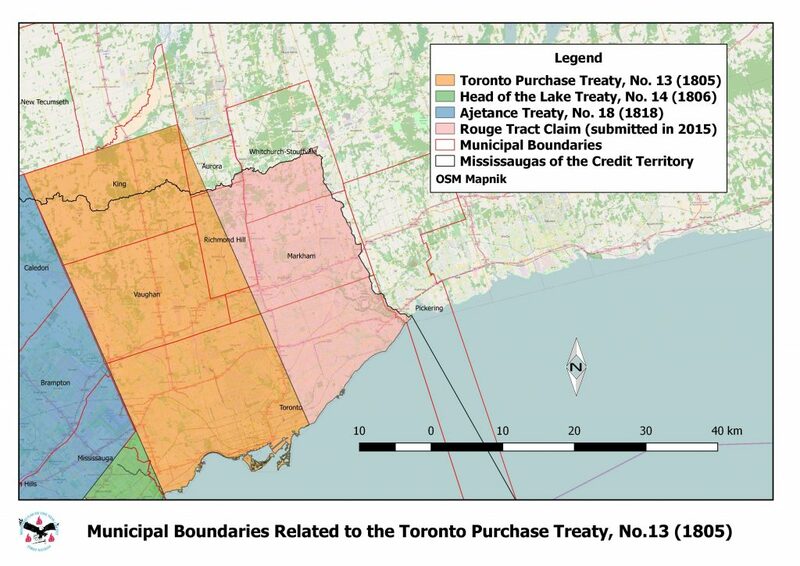 On August 1, 1805, the Crown purchased 250 830 acres of land for the sum of 10 shillings while the Mississaugas reserved for themselves the right to exclusively fish on Etobicoke Creek. 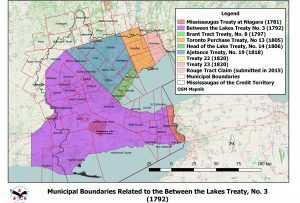 In 1986, the Mississaugas of the Credit filed a claim against the Government of Canada relative to the 1805 Toronto Purchase Treaty. 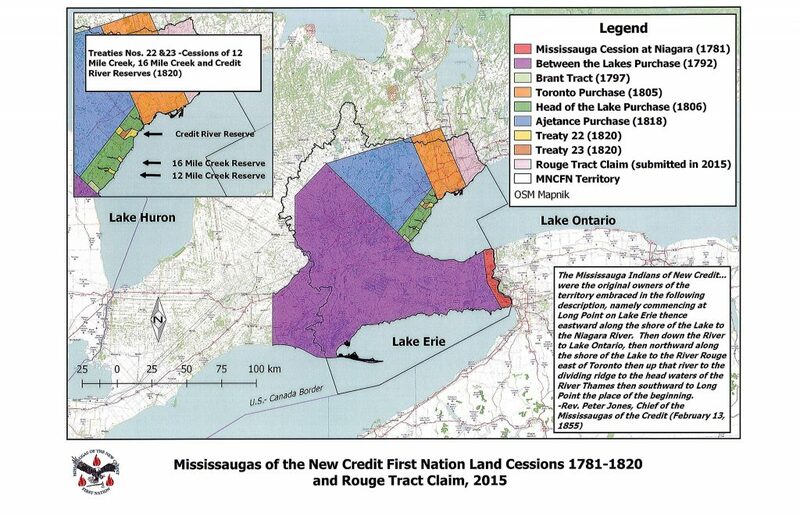 The Mississaugas contended that the Crown had unlawfully acquired more land- including the Toronto Islands, than had been originally agreed upon in the Toronto Purchase Treaty of 1787. It was further claimed that the Crown had not paid a reasonable sum for the land obtained in the 1805 agreement. 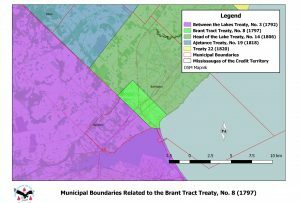 In 2010, the Government of Canada settled the Toronto Purchase Claim and the Brant Tract Claim for compensation of $145 million- at that time the largest claims settlement in Canadian history. 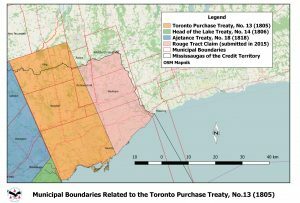 The cities of Etobicoke, Toronto, North York, York and Vaughan are located within the boundaries of the Toronto Purchase Treaty lands.